Gravel yards can't replace the natural beauty of turf grass. Oftentimes, gardeners decide that its time to plant grass when they tire from the rocky texture of gravel and the dust that plumes up in the dry heat of the summer. The best time to covert your gravel yard to grass is either in the spring or fall months. It is difficulty to keep grass moist enough for root development in the summer. Soil preparation is imperative when converting the lawn to remove all of the gravel and produce a soil that has enough nutrients for grass growth. Sell or give away the gravel from your yard. Shovel gravel into a wheelbarrow to remove. Use a rake to pick up stray pieces of gravel. It is important that all of the gravel is removed before laying sod or seeding. Spray the yard area with an herbicide that contains glyphosate to remove weeds that popped up in the gravel or underneath. Wait two weeks before planting grass to prevent herbicide residue in the soil from harming your plants. Till the soil area. Soil underneath gravel is typically compacted due to the weight of the gravel. Increase soil drainage and fix compacted soil with a soil aerator. Push a core aerator back and forth across the yard area. Core aerators dig up plugs of dirt 3/4 to 1/2 inches in diameter and 1 to 6 inches deep in the soil. Rake up the plugs of dirt. Add nutrients to the soil with starter fertilizer. Gravel yards tend to have infertile soil, because organic matter like leaves have not been decomposing on the yard. Use a starter fertilizer that has a nitrogen-phosphorus-potassium amount of 5-10-5 at a rate of 20 pounds per 1,000 square feet. Work the starter fertilizer into the first 2 to 3 inches of soil. Water the area. Pour grass seed into a drop spreader or install sod. Use the recommended amount of grass seed for the grass type you are growing. 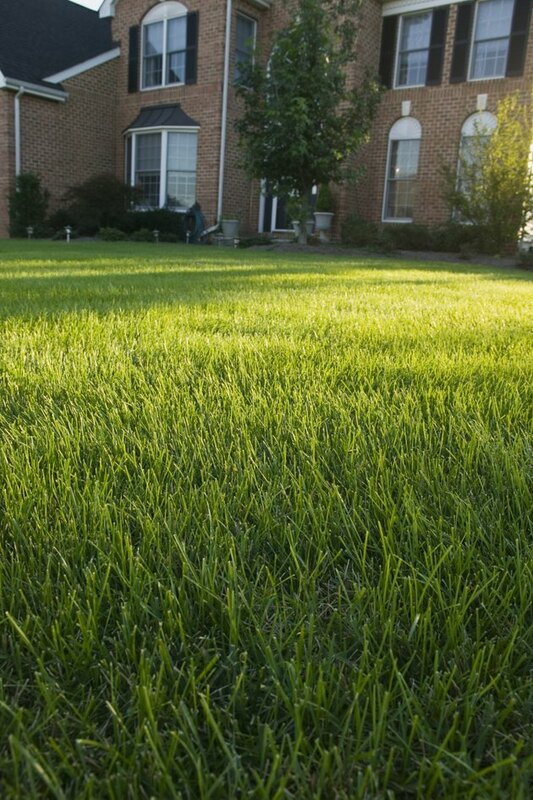 For example, hard fescue is distributed at a rate of 6 pounds per 1,000 square feet. Cover the seeds with 1/8 of an inch of compost. Sod is laid in staggered rows from the perimeter to the inside of the yard. Water the grass seed or sod. Apply water three to four times a day until grass seedlings emerge or the sod knits to the soil. To tell if sod has started to knit to the soil, lift up a piece and look for roots burrowed into the lawn.